Last Thursday was a great day of networking for me. 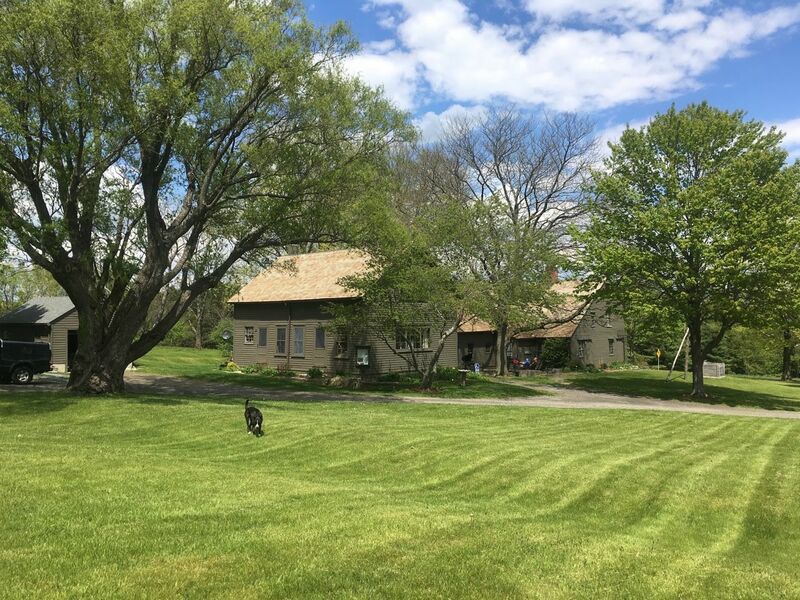 It started off that afternoon at the beautiful Kellogg Conservation Center in South Egremont, Massachusetts. 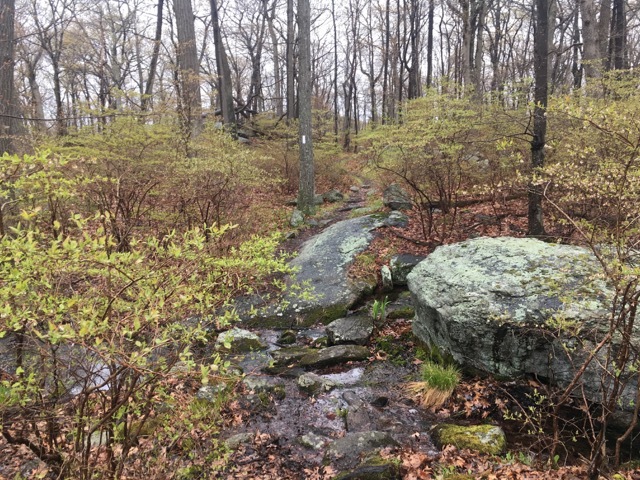 I was there to meet the new seasonal ridge runners hired by the Appalachian Trail Conservancy, and along with our Connecticut Appalachian Mountain Club leaders, to teach them about how we manage our section of the trail. Our state comprises 90% of the ground they will cover in their role, the other 10% being the southernmost section of Massachusetts. The new ridge runners should be out there on the trail as of this week to help should you need it. Say hello, and have a chat. They are a nice group and are out there to help hikers and take care of the trail, like me. My job and the ridge runners’ job is essentially the same with a few exceptions. They are paid to be on the trail all season, while I go out mostly on weekends and days off and volunteer my time whenever I can. And they also attend to the stuff inside the privies which I’m not going to complain about being exempt from having to do! But we are both out there for the same reason, doing pretty much the same thing. So It’s important to know each other, of course. We will see each other a lot. When I arrived I got a nice tour of the building and grounds, which was cool because this is where the ATC oversees and coordinates everything for the trail in the area and I got to meet some of their management too. I really enjoyed seeing the canvas hut-style tents that the ridge runners were camping in for their training week. These are also the same kind of tents the campsite caretakers use. If you’ve been to Sages Ravine campsite you know the ones I mean. They are large white canvas tents and hold two cots in them with plenty of room to spare. They are obviously meant for longer, semi-permanent stays. 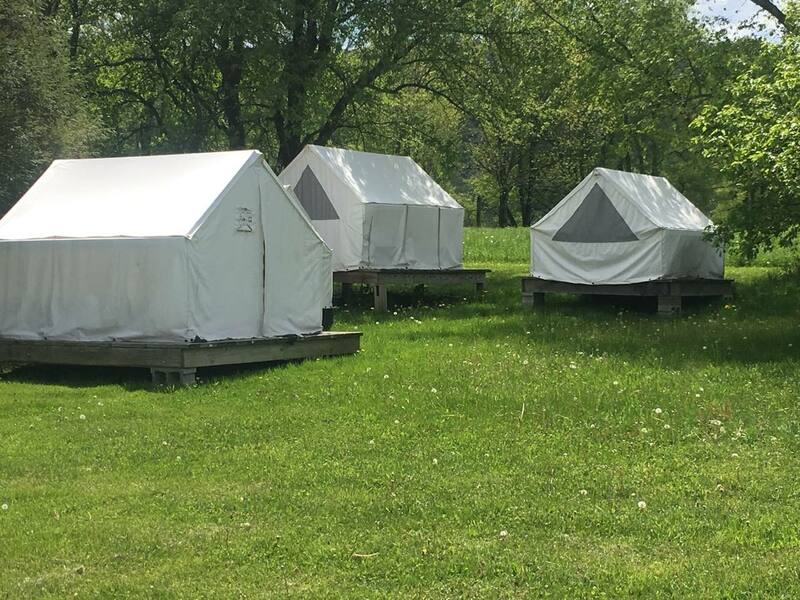 Being a bit of a civil war history nut, they really remind me of civil war officers’ tents. After the official business we had a BBQ and got to chat and get to know each other. I’m really looking forward to seeing everyone out on the trail and all that we will learn. We shared some stories about the abundance of nightmare fire rings we’ve already dismantled. Someone out there is a master builder. Nice skills… too bad it’s not allowed. 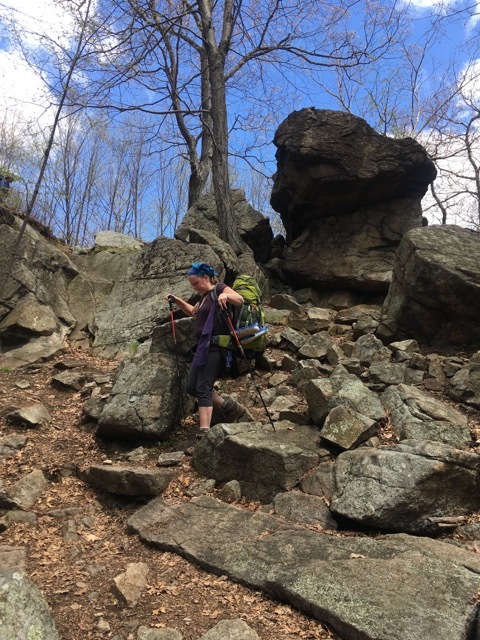 I’ll be staying at Race Brook Falls campsite next month on a hike with our friends from Sages Ravine to Shay’s Rebellion site, so I told the ridge runners to say hi if they see me as they pass through. Speaking of which I loved that you could see pretty much the whole of that hike from Mt. Race to here from the lawn of KCC. I snapped a few shots and sent them to our friends to get them more stoked. 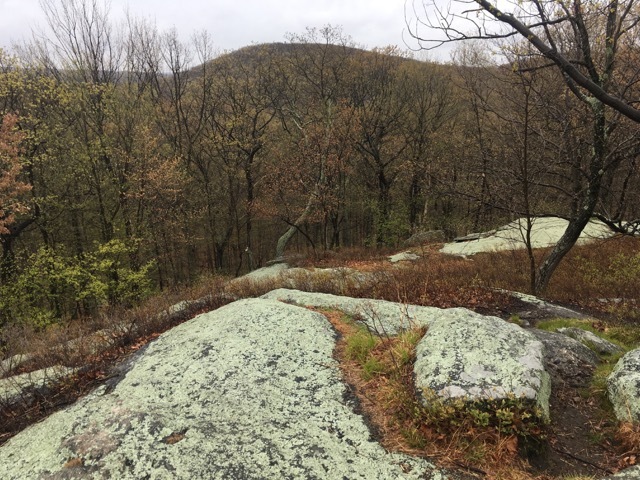 I am looking forward to coming up with their trail names and covering this beautiful section of trail for the first time, and for us to have our first backpacking trip with friends. I hope that’s a tradition we continue. As the BBQ wrapped up I headed down to Salisbury to meet up with a hiker I met on Whiteblaze.net, Rainman. He was doing a section through Connecticut and Massachusetts and it just so happened he was in Salisbury that evening, just 15 miles south of the KCC. I drove down the beautiful Route 41 past all the trailheads for the Elbow Trail, Race Brook Falls trail and Under mountain trail as well as the A.T. crossing just east of town en route to Mizza’s Pizza where he and a few others he was hiking with were having dinner (photo to come when Rainman can download it from his phone). They were staying at trail angel Maria McCabe’s and she had dropped them off there to have dinner and do laundry at the laundromat behind the restaurant. We had some pizza, shared some stories and then I gave them a lift back to Maria’s before heading home. The sun was setting and casting amazing beams of light across the valley and the mountaintops. I wanted so badly to stay on the trail that night and hike the next few days but it was not in the cards. The pizza was tasty and they offer you free ice cream at the restaurant! Maria’s info is in the AWOL and other guides if you want to stay there. I was hoping to meet her but she was out herself at the time. Her house is just a short walk from the trail. I also just took advantage of REI’s big Memorial Day sale and got the bucket of Mountain House meals and a new tent. Did I really need a new tent? Well, no but I am out there a lot. So that’s my excuse. And the lighter the load the happier the hiker. And this tent is nearly a full pound lighter than my current solo tent. It’s also the REI brand which I have been really happy with so far for their quality — not just the guarantee. I know the smaller manufacturer’s have great customer support too… not hating on them. The reviews were also fantastic for this tent and at 20% off to boot I couldn’t resist. I set it up in the yard yesterday as they recommend doing so because the set up is a little odd. I think I am in love. Fielden Stream loved it too. What a great tent! It will get its first official use this weekend when I’m up on the trail in the Bear Mountain/Lion’s Head area. If you’re out there say hello! (As usual, rain seems to be in the forecast) Because of its unusual pole design, it’s very roomy and super light. I swapped out the stock stakes with some MSR mini groundhogs and some Vargo titanium sheep hooks. I am going to try it without a footprint to save space and weight. 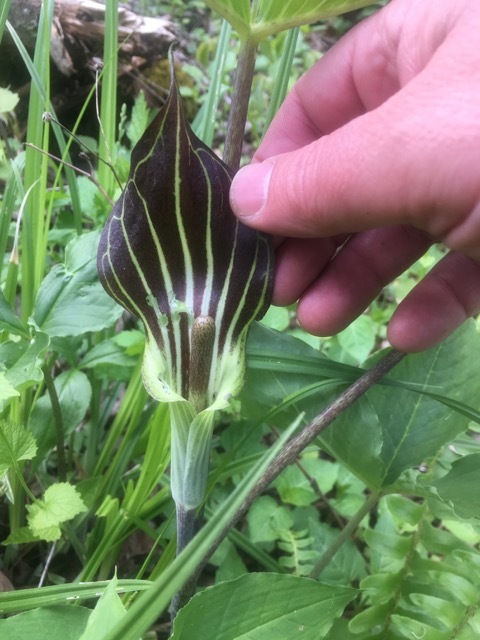 I had been doing all kinds of research on the lightweight tents including the great cottage industry ones from Henry Shires (Tarptent) as well as the Zpacks Cuben Fiber tents and offerings from Lightheart Gear. Mind you I’m always researching since I’m inundated with sales and offers and reviews in my email inbox! 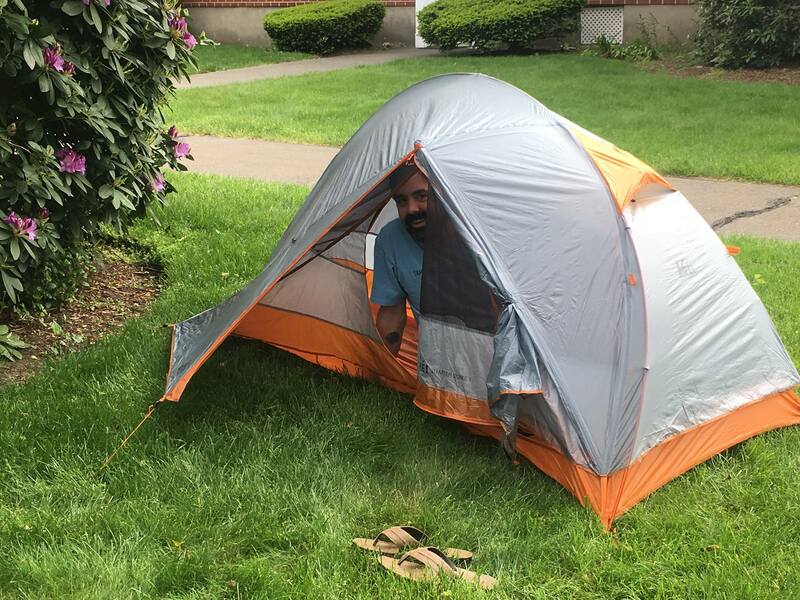 Massdrop has a great offer on the Zpacks Duplex right now but while I can justify a new tent that will get lots of use and is significantly lighter, those tents are way above my budget. And while they are even lighter, I also feel most comfortable and familiar with a double-wall tent at the moment. I checked out a couple other new double-walled offerings from MSR and Big Agnes but ultimately I found the best deal and bang per buck was this REI Quarter Dome 1. And while this is only semi-freestanding, you really just have to be sure to stake down the foot end to get it to full functionality. I suppose it would be annoying to set up on a platform or rocky area but I avoid those anyway as they just kill my back. I do really still like my Easton Rimrock 1p tent and it will make a great tent for when a friend wants to come along on the trail. I love the way you can open both sides of the vestibule on that tent and use trekking poles to make a roof. At 3.2 lbs its still a very viable solo tent and will remain in my gear quiver. I was going to sell it but I realized I can lend it to buddies who might join me for a hike I hope one of these days. Now that the season is in full swing, I have been very active with the club! Not only does volunteering feel good, but I always have fun with this great group of people. 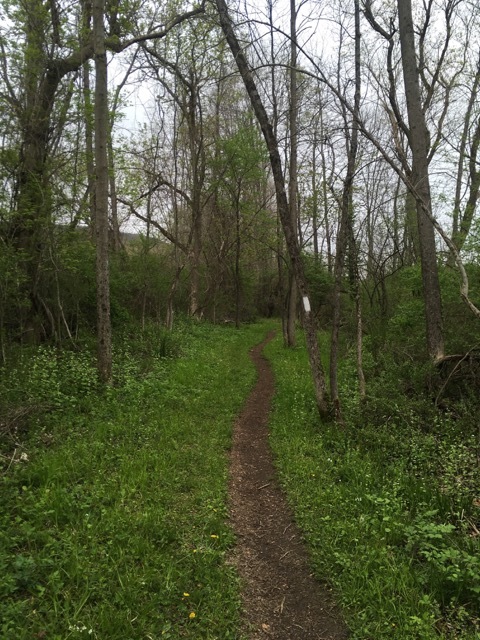 I am going to start calling my volunteer weekend writeups “A Day in the Life of a Trail Patroller” to lend some consistency to those entries during the season. About a month ago I attended the wilderness first aid weekend course at White Memorial Foundation in beautiful Litchfield, CT. We spent two full days learning skills for emergency situations in the backcountry as well as a CPR class. They were taught by the reputable SOLO schools based out of New Hampshire. Those of us who wanted to stayed over in the bunk rooms over the classrooms. Meals were provided, and we all did some cleanup chores throughout the weekend as any good volunteers would! I learned a lot, made some new friends, gained some confidence and a greater sense of security for when I’m out hiking, and as an added bonus I got to visit with a Barred Owl! It was being cared for by the conservation center because it was no longer able to survive on its own in the wild. This is by far my favorite kind of owl and I’m sure it thought I was quite strange talking to it! Where we first filtered water! Then the day before mother’s day we had our annual “Give a day to the A.T.” On this day, we all get together to do various trail projects. Whereas our “A.T. Day” in October includes some of these projects, it’s mostly a bunch of hikes of various length and difficulty to enjoy the trail we work so hard on. Like on our volunteer roundup day, we started with a gathering over breakfast to do introductions, service awards, and then break off into groups for the various projects. 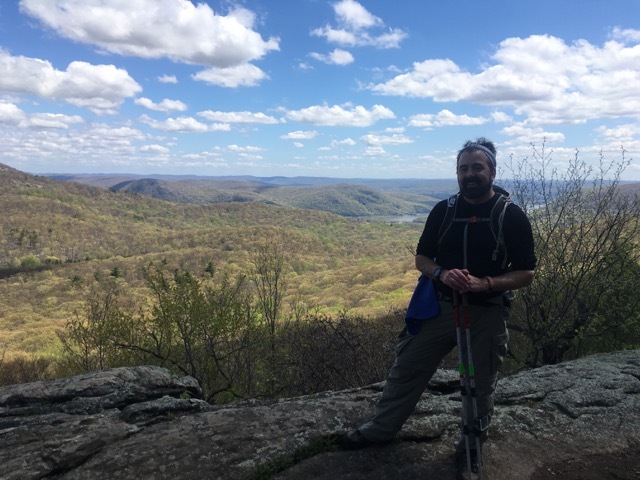 There were a lot of first-time volunteers which was great, and a few ATC (Appalachian Trail Conservancy) staff visiting from their office in Massachusetts. I will actually be heading up there in a few days to meet their ridgerunners who I will be running into often this season I imagine, so it’s good to be on the same page and know each other! 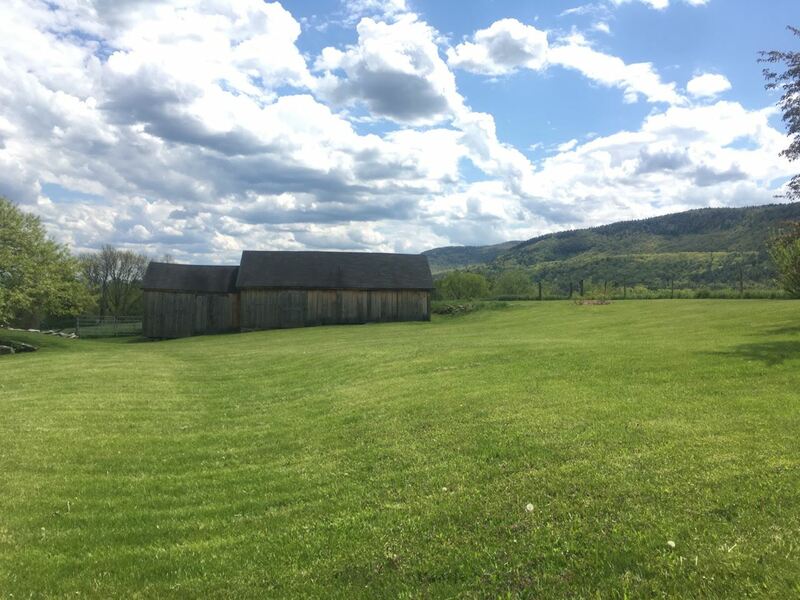 I’m also excited to see the regional HQ and be at the foot of Mt Everett, which my friends from Miami will be hiking over with Fielden Stream and I in just over a month for our first section into Massachusetts! As we all divided up into our various project teams, I joined my trail patrol group which I would co-lead on this day and we went over the different paperwork, scenarios and Q&A before heading to the trail for our hike. We headed to the river walk section in Kent, which is where I too did my training. From end to end its about 4.5 miles. This time we started at the northern end of the section, just below Silver Hill. We headed south and within the first mile already I had spotted a stealth campsite. Despite having 2 campsites with privies, and a shelter with a reliable water source less than a mile away, this hiker set up right off the trail, and left not only the remains of a fire, but some empty beer cans. While I don’t know the circumstances that might have led this person to camp here vs. the resources just ahead, it’s something that’s becoming more and more of a problem. I want to give the benefit of the doubt that this person had some weather-related or physical condition that forced them to stop here. But, its hard to believe that when there is trash in the form of alcoholic beverages left at the site. I’m hoping that by talking about these things bluntly I’m helping to educate and advocate leave no trace practices and about the hard work volunteers do when people don’t follow the rules. I hope it doesn’t sound like a lecture. We do our best to patrol the trail and educate hikers as frequently as we can, but unfortunately we can’t be there every day, and so people with less consideration or understanding of the impact of their behavior are doing these things more and more. I want to believe they don’t know any better. 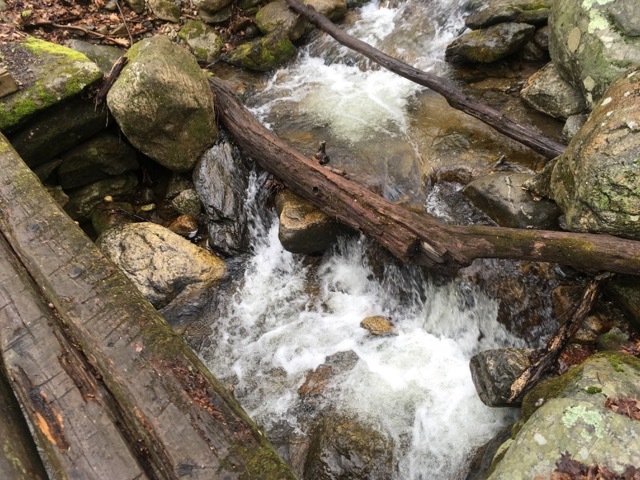 But there is also a growing level of arrogance and irresponsibility with some of the hiking community, as well as locals who disregard the rules. I know they all can read the signs we have posted in either direction from here. You can usually tell pretty quickly which things are newbie mistakes and which are flagrant disregard for the environment and the maintaining clubs. We cleared that site and headed for the next campgrounds at Stony Brook. I headed up to the group campsite while the others headed to the individual campsites. This is a beautiful area with a large flowing brook of the same name flowing down the mountain between these sites. At the group campsite I found and cleared evidence of a small fire, as well as several bathroom wipes someone had left where they had used them. Maybe they buried them, but animals will find these and they will dig them up. If you’re camping up there you probably know you’re going to be miles away from a trash bin, and should bring a bag to pack it out. These wipes are not especially biodegradable. Along the access trail there was a large site where a fire had been made and many of the logs were left leaning up against another, almost with the intention of returning here to save them for later use. Hopefully my clearing of the area will get the hint across. Another constant: where there’s a fire, there’s trash. And sure enough I had to clean aluminum foil, styrofoam and other trash from the site. This at least gave me the clue that this was likely a local and not a thru hiker. Most thru hikers would not bring a Dunkin Donuts coffee cup out on the trail with them. Also, most thru hikers don’t make fires because they’re too tired and had too long a day to do anything but setup camp, cook their dinner, and go to bed. 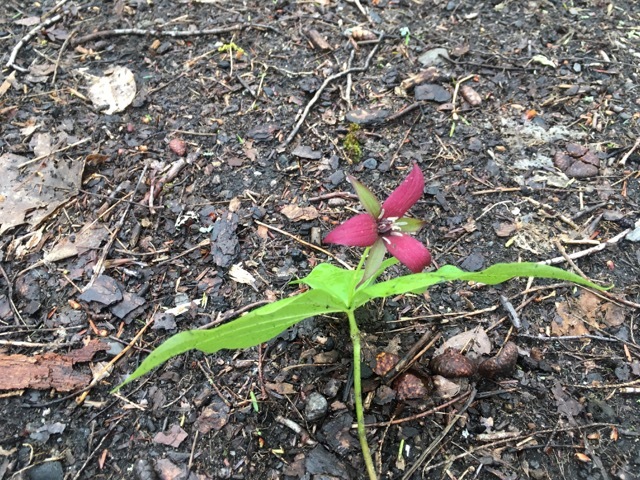 On the upside, I found a lovely bunch of Trillium blooming here. At the individual sites we had to clean up two fire rings, one of which included some massive rocks. Had I not been with a group I’d be pretty peeved having to do that alone. They were very heavy and it took at least fifteen minutes for the five of us to clear and cover it. 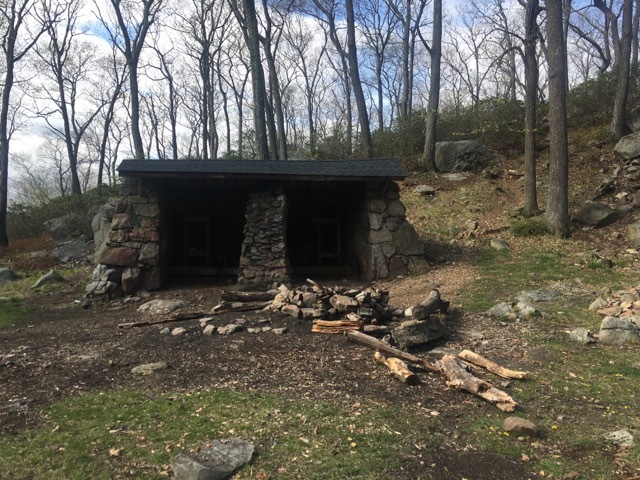 We moved on to Stewart Hollow brook where we took a lunch break, signed the register and then got to the work of clearing trash from the shelter and privy, and one fire ring we found behind the shelter. Again, its just baffling to me how we can post a sign saying no fires at every one of these sites and people will just do it. At this point our work for the day was over and we headed back to the picnic area a few miles north for our social and wrap-up. This past Sunday I did another patroller hike in the Ten Mile/Bull’s Bridge area. This was a special day for many reasons. 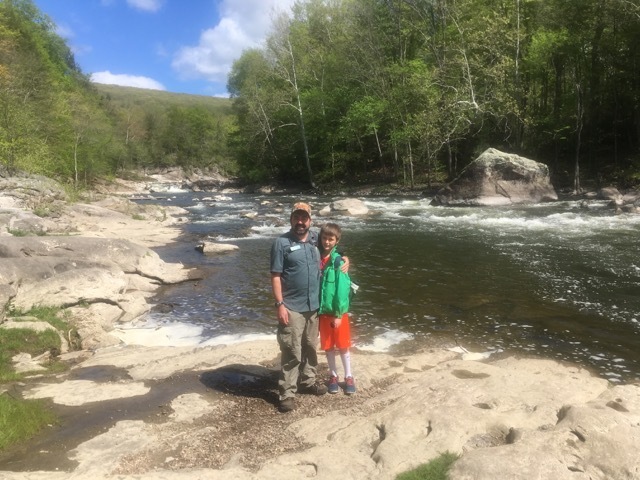 I was thrilled to have my son “Jiffy Pop” along for his first day of volunteering with the AMC, and I also had been wanting to spend some time with my new friends on the Bulls Bridge task force and learn about what they do. My friend Ray is one of the members of the task force and he invited us up to join him Sunday and to do exactly that. I was planning on taking Jiffy Pop down from the bridge to Ten Mile River campground and shelter to learn about what I do and assist me, and Ray and his team also patrol this section regularly. So we planned to do that walk together today with my son. Up until just a few years ago, people would come from all over, near and far, to party down by the river. They’d bring BBQ grills, coolers, chairs… a large spread. Then they’d have their party or their picnic or both, and promptly leave most of it there, or at the trailhead and go on their merry way. While they were at it, they would fish without a license, swim where you’re not allowed to swim, and get themselves into all sorts of situations, despite the posted signs stating these things were forbidden. So the AMC and the other local land managers came up with a plan to have a group of volunteers man the trailhead and educate people as they came in about what’s allowed, and keep out what was not. And its a good thing. 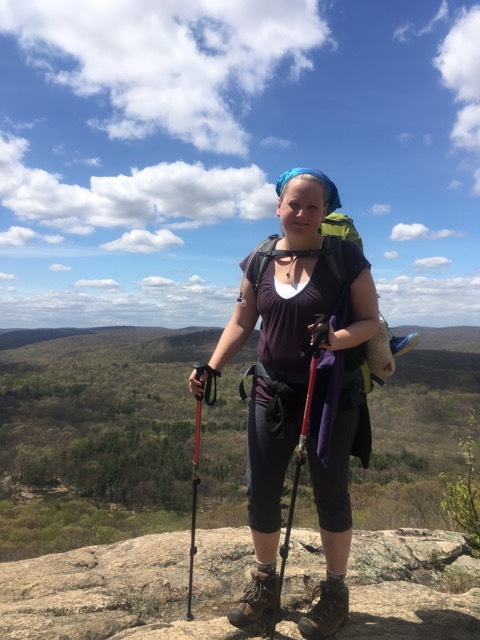 I remember our first section hike on the A.T. in Connecticut in 2013. When we passed by here there were piles and piles of garbage. It was revolting. And really sad to see. That was all trash that was left behind that someone had to clean up, and it wasn’t the people who left it. Its a shame people can’t be more responsible but I’m sure you’re seeing the pattern here. So for the last few years the task force has been a fantastic solution. Like me, these guys volunteer their time all season for free. So if you see them, thank them for their hard work to keep the area beautiful and safe. Ray, Jiffy Pop and I headed down the trail, which at this point from the kiosk is a blue-blazed trail which soon intersects with and forms a loop with the A.T. 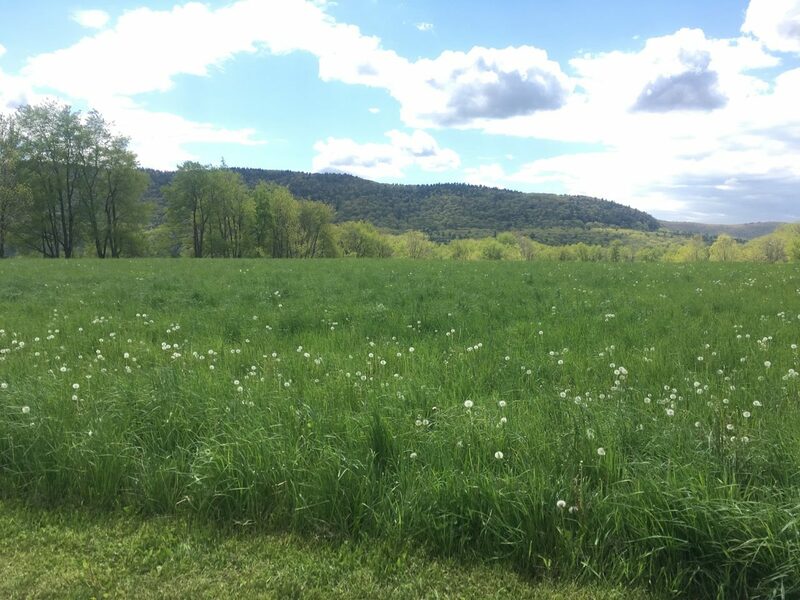 It is going to be called the Homestead trail soon, as there used to be an old homestead along it just past where it intersects with the Appalachian Trail. You can still see the two chimneys from the home – the original stone and later brick chimneys. And during the winter when its not leafed out you can see the foundation of the old barn. I had not been on this trail before though I had passed it many times thinking it was just a dead end since it said it was not maintained. Just before we headed off towards the homestead, we went down to a spot along the river and Ray told us about some of the situations they’ve had to deal with there. 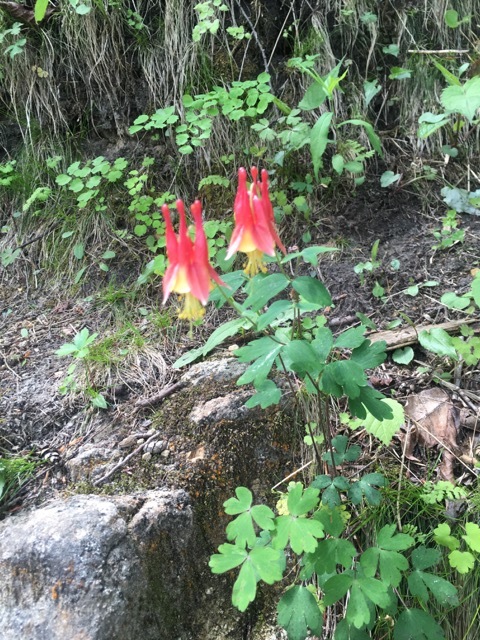 We saw lots of beautiful Columbines in bloom and I snapped away with my camera. We then headed down past the homestead and to the old Ten Mile River group campsite which is no longer in use and now along this homestead trail. 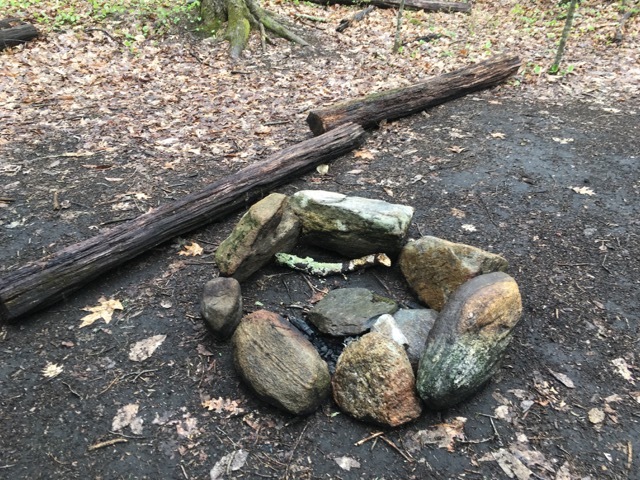 However someone had set up and camped here recently and so we had Jiffy Pop help clear and brush over a fire ring and camp site for the first time. He loved helping. I was so proud! We then crossed the Ned Anderson memorial bridge which was lined with cobwebs and a fun conversation piece for Jiffy Pop. At the campground we met two backpackers that were out for an overnight section hike and were camped in my favorite spot by the river that I set up in last month. We chatted a while and they said they had also seen the blue heron I saw on that trip. 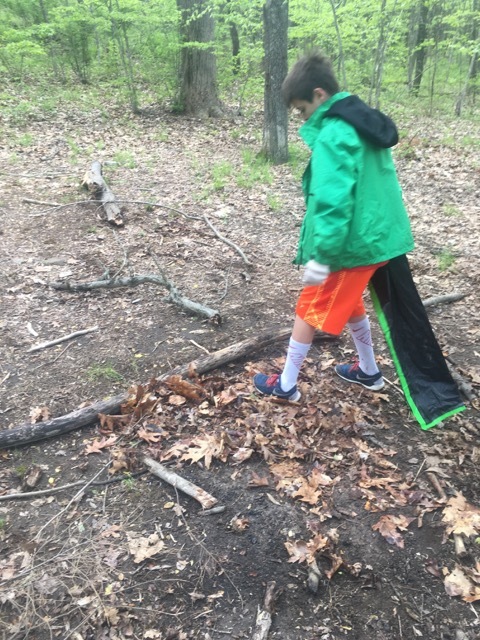 We cleaned up the trash in the privy and another small fire site at the shelter. On the way back we met a northbound flip-flop hiker headed to Maine who had started in Shenandoah, as well as another couple out for an overnight. I also wanted to just say that the buckets in the privy are not for trash, they are for composting material like leaves or woodchips for the privy. Please don’t leave your trash in here. We just end up having to pack it out. We headed back over the bridge and picked up the A.T. northbound back to the blue trail and the trailhead where Ray gave Jiffy Pop an Appalachian Trail junior park ranger pin and we had some birthday cake one of the other Bulls Bridge guy’s wife had made him and that he had left for us. As I was writing up my notes, a few more of the guys showed up and we spent a little time with them before we left. 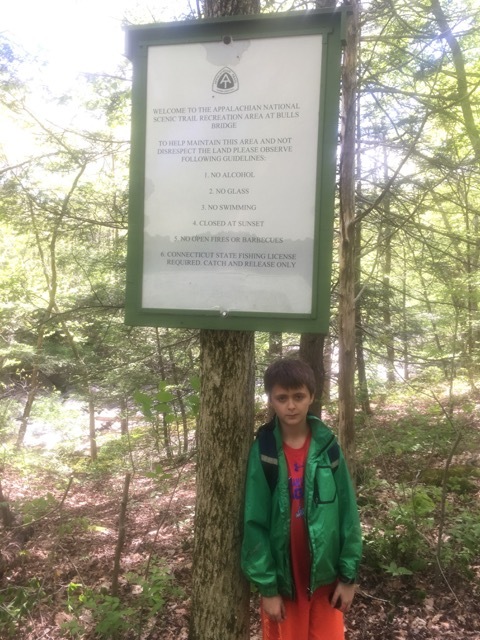 We met a lot of nice day hikers and families out that day too, and my son had a great time and is looking forward to doing it again. Hopefully he can talk his friends into it now that he had such a good time. 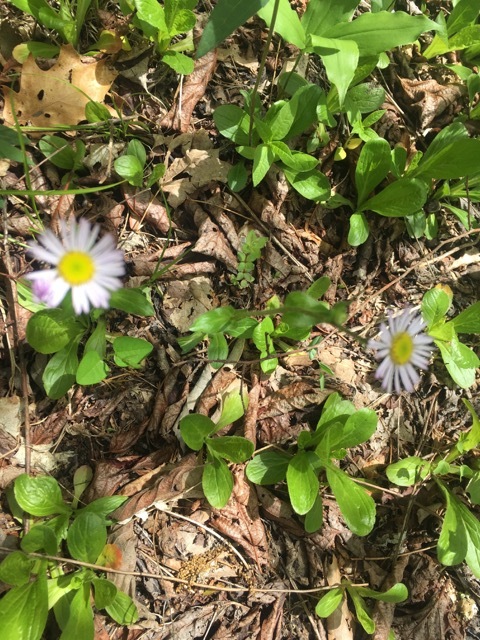 And as you can see above I enjoyed spotting all the wildflowers like Columbine, Chicory, Oxeye Daisy, Violets, Buttercups, Spotted Wintergreen and some I was unable to name as I packed up my wildflowers book for my upcoming move. Feel free to chime in if you know the others. 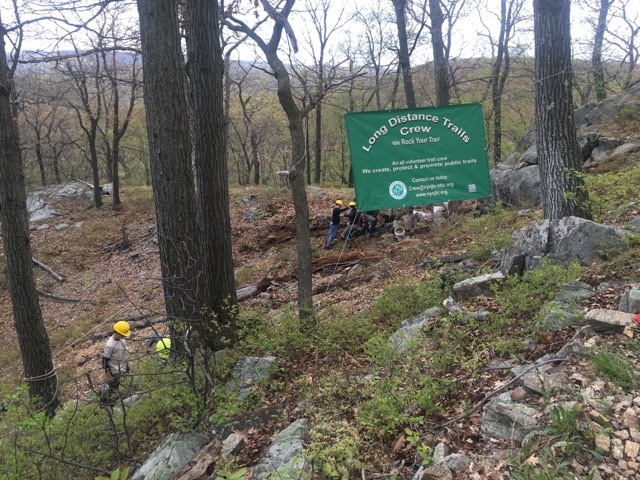 I had another great day volunteering with our Connecticut trail crew yesterday, which I will talk about in more detail next time. 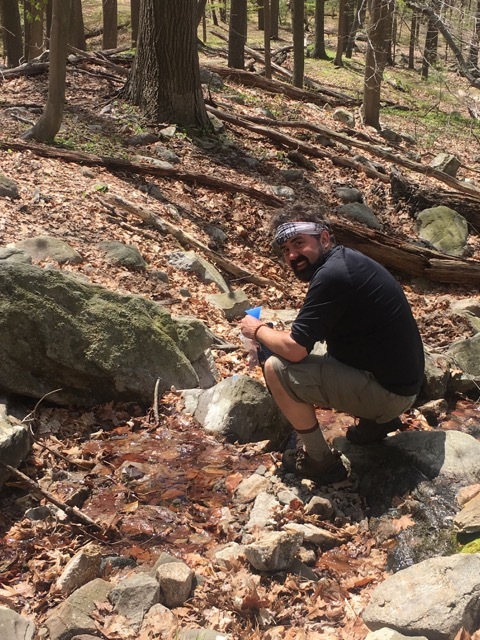 But last weekend Fielden Stream and I got to do the section of the Appalachian Trail in New York that we had had to skip and substitute with another due to time constraints. And it was as tough but as great as we expected it to be. As you may know we are doing New York southbound. And we have had to skip sections and come back later like this once or twice due to scheduling logistics. 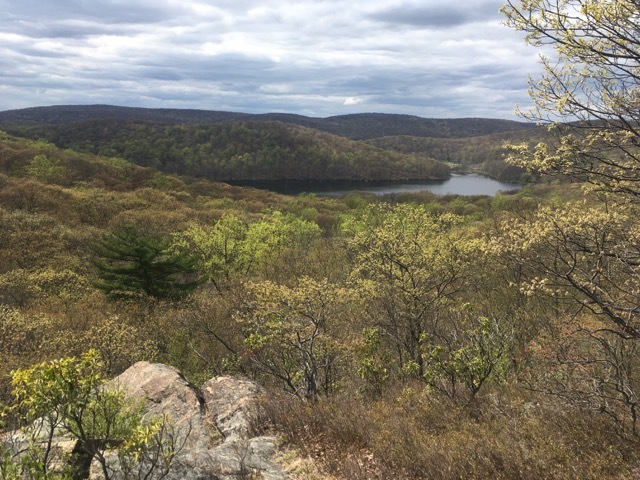 This hike was to cover the last 9 or 10 miles of section 10, which starts at the Bear Mountain Bridge. With this segment done, we’ve now covered all but the last 17.9 miles of the New York Appalachian Trail, which is a total of 90 miles. So we are feeling good. I hadn’t expected to get three hikes in New York in already this season. But since we will be moving over the next few months, we won’t be getting out together much until late summer, and so are taking advantage of what time we have now. We plan to finish New York before the season is over, and we will also be doing one section of Massachusetts with friends at the end of next month. But besides that most of the hikes over the summer will be me doing my volunteer work. 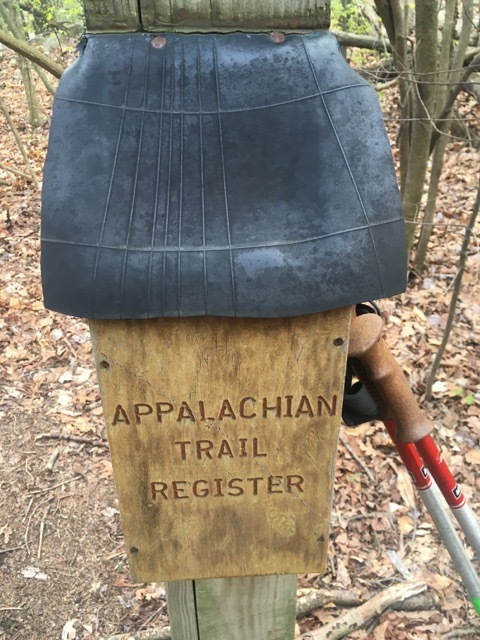 I have met lots of great people on whiteblaze.net, a very popular internet message board focused on the Appalachian and other long-distance trails. I get incredibly valuable tips on gear, resources, landmarks and resupply points, and shuttles (people who volunteer rides along these trails.) In this particular instance I was hoping to save us from bringing both cars or hiring a cab, which can be hard to find and expensive in more rural areas and parks the trail corridor passes through. Not only did I find Suzy from MyHarriman.com for the last section hike’s shuttle there, but another member offered us a future ride as he also lives in the area. So this time he gave us a free ride from our end point to the start point, and he and his wife were planning on their own overnight in the park later that day. Shout out to Bob — thanks! Luckily we didn’t have to head out late after work again on a Friday night for this one, and had a full day and a half for this overnight… which is a luxury with our schedule lately. We arrived at the lot at Tiorati Circle that we started at last time. Bob and I had arranged for our pickup and he was waiting for us when we arrived. We had a nice in-person introduction and then chatted briefly as he drove us north along Seven Lakes Drive to the 1777 trail lot. 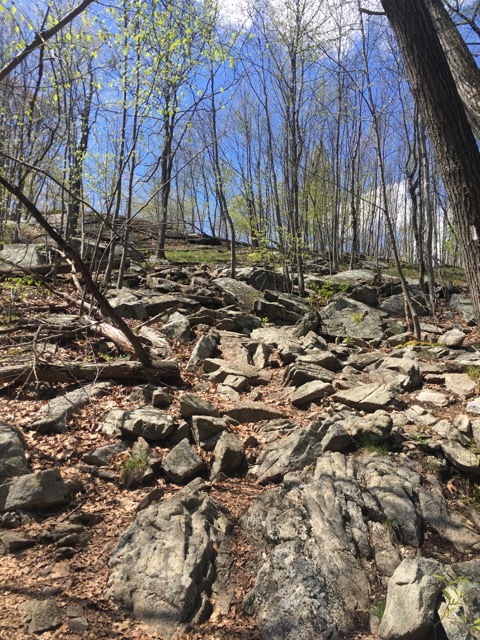 This lot and trail are named after the route that the British troops marched into the area to attack the colonists and take Forts Clinton and Montgomery in 1777. There is a plaque here that outlines a bit of this history. As with our last hike in the area, we took the 1777 trail east a short distance to arrive at its crossroads with the A.T. where this time we would head south over West Mountain. We knew it would be a good climb up. Actually, it’s a fairly ambitious climb up any side of this mountain. I’ve gone down the southern end on the A.T twice now, and up the Timp-Torne trail on the eastern side to the shelter there with the famous view of New York City. But this is the first time going up this side, and there were many rewarding views on this route as well. 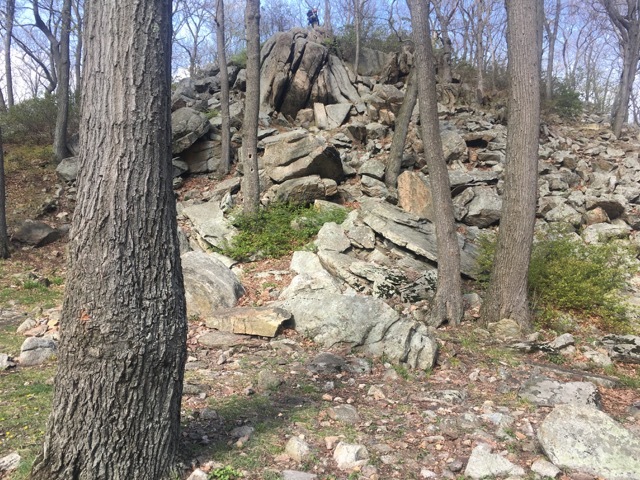 Soon after leaving the 1777 trail, the A.T. began to ascend the rocky face. It wasn’t that bad as far as steepness goes, but it was rocky. Soon we were rewarded with multiple views north and east of Bear Mountain, the Bear Mountain Bridge, the Hudson river, and west and south to Harriman State Park and the peaks we would ascend later this day. There were many hikers and backpackers out for the day here, including a group of 4 guys we would end up spending the overnight at the shelter with. In fact they were the first group we saw, just after getting on the A.T. 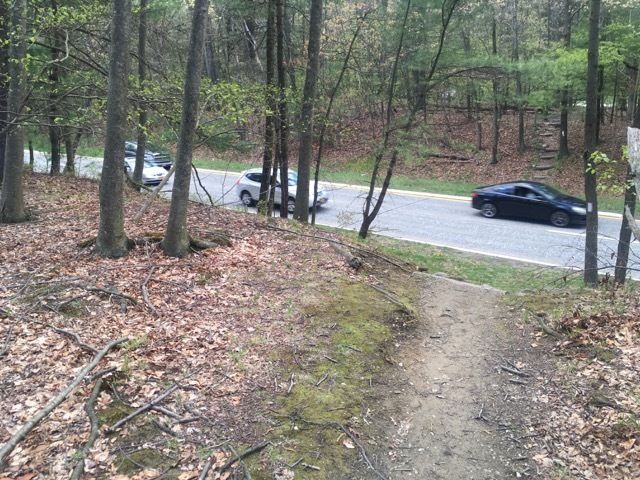 This scenic part of the trail is a great (and obviously popular) loop option as you can park in the Anthony Wayne recreation area parking lots below which are massive and stretch the length of the mountain. So many people will start and end at the lot and take a combination of the A.T., Timp-Torne and the Ramapo-Dunderberg trails. I did this combination of trails on an overnight adventure by myself last summer. It was a beautiful day last Saturday, and the views from the mountaintops were long. The ridge of the mountain was heavily populated with young Beech trees. 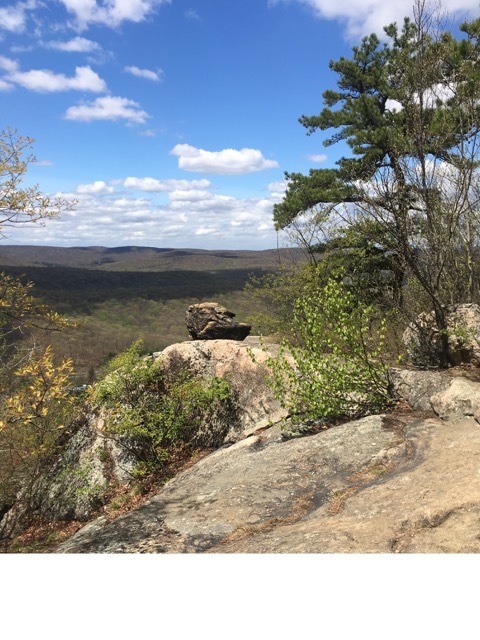 We stopped for lunch at the northern view of Bear mountain and the bridge and also enjoyed many sweeping westerly views as the trail followed and descended the western ridge. One big mountain out of the way, we were ready for our exciting crossing of the Palisades Interstate Parkway. But first we got water at a tributary of Beechy Bottom brook at the foot of West Mountain. 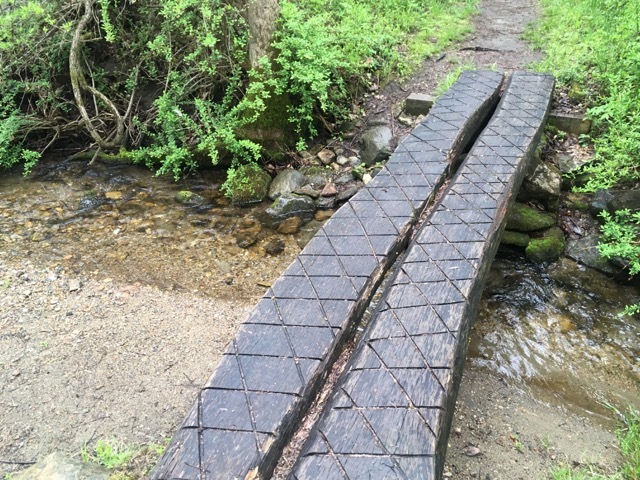 This park is not known for abundant water sources, so you get it where you can. Crossing the parkway was definitely exciting as the road was busy and the drivers were zooming along at a good pace. There is actually a trail register in the median between the northern and southern lanes. Fortunately the two directions are separate so you don’t have to do a full frogger; you can keep an eye on one direction of traffic at a time! When we got to the register we signed it that we had at least survived crossing the northbound lane! We got some great video of running across the southbound lanes, and that will be part of our New York A.T. video which we will add to this site later in the year when we finish the state. We then prepared ourselves for what ended up being an even-steeper-than-expected climb up the eastern side of Black Mountain. We read that there would also be views all the way to the skyline of NYC from the top, so we did have some extra motivation to push up it. We told ourselves we’d have a nice long break and a snack here as well. The first part was not too bad and switch-backed up a lower shoulder of the mountain where it crossed the 1779 trail. Not to be mistaken with the 1777 trail, this is the route “Mad” Anthony Wayne (who the recreation area is named after) led his American troops on to take back Forts Clinton and Montgomery two years later. As we approached the crossing we spotted many runners on the trail who were taking part in a 50-mile run through the park. I don’t know what the cause was, or if there was one, but many of the other trails we would pass this day also had the route marked on the trees with colored ribbons. Suddenly our 5.25 miles planned today seemed a little less tough, though we did have a lot of weight to carry and much more of our route was straight up and down over mountain tops. As we reached the top of this first shoulder I saw the truly steep part ahead. I saw another couple taking their time up it ahead, and then chatting with someone else up there. 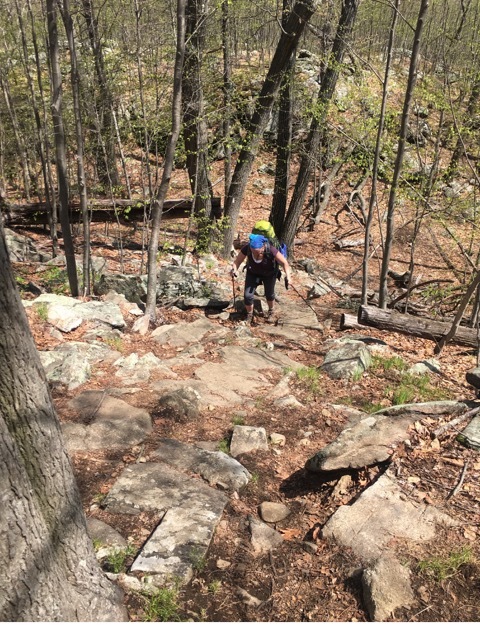 As we reached the top of the first steep climb up some heavily eroded trail, we saw a New York / New Jersey Trail Conference work crew creating a set of new steps here to eventually route it off the eroded slope. It was one of these volunteers who had been speaking to the couple we saw earlier, about the work they were doing. When they had headed on, he also showed us how they used pulleys and metal wires to lift and move heavy rocks from one spot to another. It made me think of how the ancient Egyptians and Romans probably built their temples. He offered to bring us down closer to the work, but looking up ahead we saw we still had an even steeper scramble up a rock face and just wanted to get it done and get these packs off for a while. 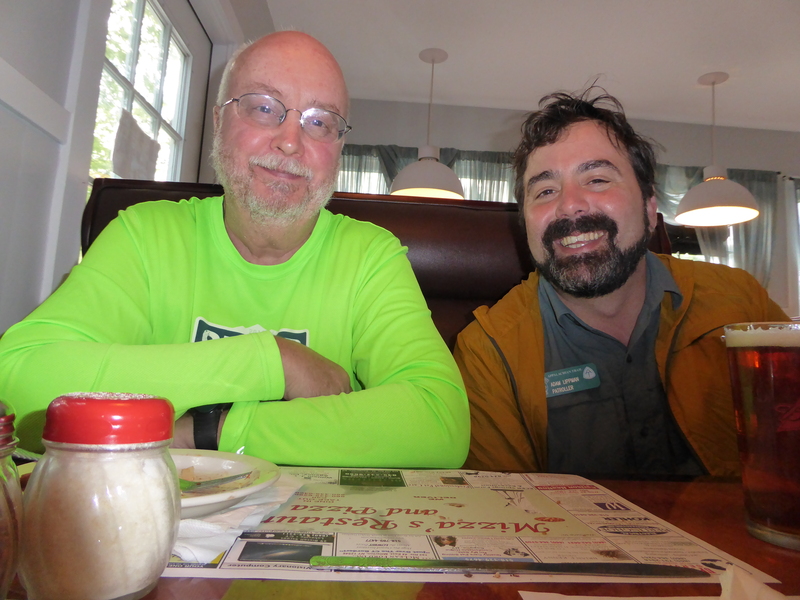 But I did tell him how I was a Connecticut volunteer and am involved in projects like this often and we had a nice conversation about that. We thanked them for their work as we went up the final steep section, where more of the volunteers were building stone steps into the rock face. 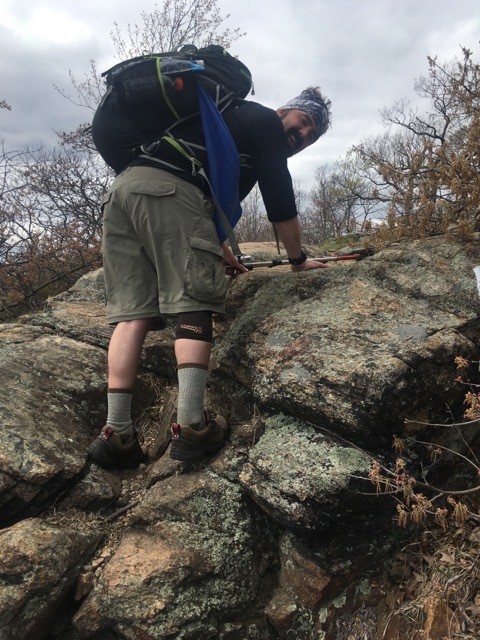 We reached the top and walked along the ridge to the summit where we sat with our packs off, taking in views of the New York City skyline and having a snack of beef jerky. From here we saw the next and last mountain of the day to climb and which our campsite for the night was on. The trail then took a similarly steep route down the west side of Black mountain, where we were also rewarded with a nice view of Silvermine lake. As we got to the gap between the two mountains there was an old woods road that led down to the lake and the recreation area there along Seven Lakes drive. The climb up Letterrock Mountain was gradual and we then followed its rocky spine to its end at a large boulder pile overlooking the shelter. 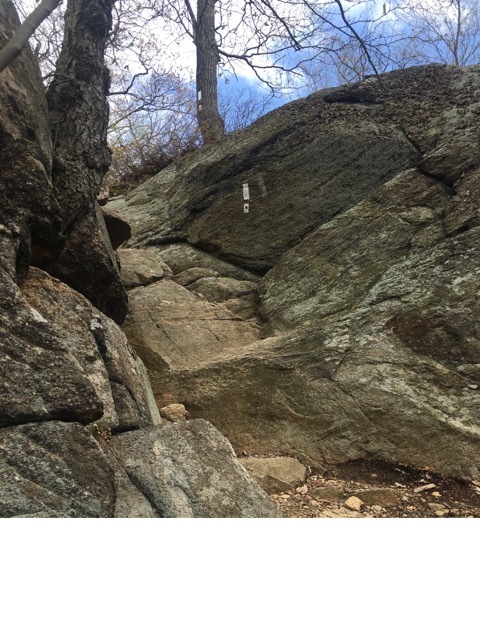 This walk along the spine looked similar to pictures I had seen of Cat Rocks and Eastern Pinnacles which are farther down the trail near the New Jersey border. I am quite sure I also saw a Barred Owl that I must have disturbed while hiking below suddenly fly overhead and into the woods beyond. I love these owls so this made me quite happy. The pile of boulders at the end of this ridge and overlooking the shelter was an exciting final descent, starting with a traverse across a large tilted slab and then through some smaller rock scrambles requiring the use of hands. I was glad we were not going over the slab in the rain. I felt bad for those who were headed that way the next morning! When we finally got down the rock scramble to the shelter we chatted briefly with one of the guys from the group we saw that morning on the trail. Two of them had been gone at least an hour on a hunt for water and he had asked if we had seen them. There were a few other tents set up so we got the lay of the land, picked a spot to set it up and to hang the bear bag and popped a squat. The other couple we saw at the climb up Black Mountain had given us a few of their bug sticks when we ran into them a bit later while they were taking a break, and we were all complaining about the bugs. So as the bugs were even more annoying by this point at our campground we lit one and it did a decent enough job of keeping them at bay. The other two guys had returned from their water trek, and some of the other campers headed off down another route on the same mission. It seemed it was at least a mile in any direction to get water from this campsite. Fortunately we filled up at Beechy Bottom brook per the advice of our guidebook and we boiled the untreated water for our meals and morning coffee so that we could keep the potable water for drinking. As we finished setting up our tent, the guys had by now gotten a fire going in the fire ring and invited us all over to join. This was their first time backpacking and had all gotten their gear the day before. Wisely, they bought affordable gear to make sure they liked doing this before breaking the bank. The gear seemed to hold up just fine for this type of overnight, though only one of them was awake to report on that before we left the next morning, and he slept in all his clothes. We told stories, listened to some music and I geeked out and told them about the Revolutionary War history in the area and taught them some backpacking and first aid tips I had learned at my Wilderness First Aid course the weekend before. They offered me some of their Jack Daniels so I gave Fielden Stream the rest of my wine, and the atmosphere for the remainder of the night was jovial and fun. The other group of hikers didn’t join us that night but they had done a very long day and went to bed after returning with their water and having dinner. Even though we knew rain was moving in overnight, we were all fortunate to have had a crystal clear sky and many constellations to admire that night. The next morning we were up and out a little later than planned as I was still feeling the effects of the whiskey and with the added sleepy effect of the rain. As no one was in the shelter overnight, we brought our tent inside after we had packed everything else into our packs and took it apart there. We hung the footprint and rainfly on the bunks while we had breakfast so they could drip dry a bit before we packed them up. We spoke about our stoves and cook kits in true gear-nerds fashion with some of the other hikers who were starting to join us in the shelter to pack up and have breakfast. We decided to skip the hot breakfast to save time and just have our coffee and granola bars. We packed up, got our pack covers on, and headed southbound. As always, the trail route went right up from camp to another crest of a mountain. I am not quite sure if it was the same mountain or the next one. But it was exposed and the rain was turning to sleet at that point. We had to stop to put our gloves on so our hands wouldn’t turn into wet, half-frozen ones. Fielden pointed out the upside which was that at least the bugs weren’t out. 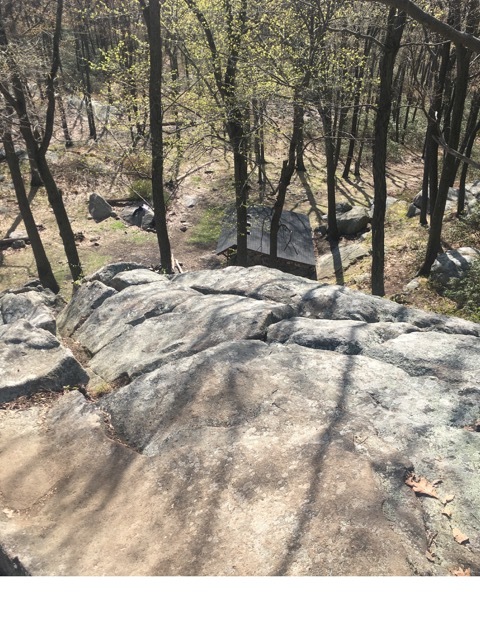 After a few miles the trail dropped back into a gap and past a few interesting rock formations, including one that looked like a cave with a closed stone door. We speculated that it was the secret passage to Ali Baba’s lair or the mines of the dwarves in the Lord of the Rings. Today’s hike out was shorter — only 4.5 miles and less steep climbs. Though there were two big ones at the end, and it was cold and rainy. It wouldn’t get over 50 degrees this day. Most of the time it was lower than that. The trail brought us down across Seven Lakes Drive, where we had passed early the previous day on our shuttle from the end point. There was a nice brook down here and plenty of good water sources except one which Fielden Stream said looked like a swamp from “Labyrinth” as it was full of bright green slime. 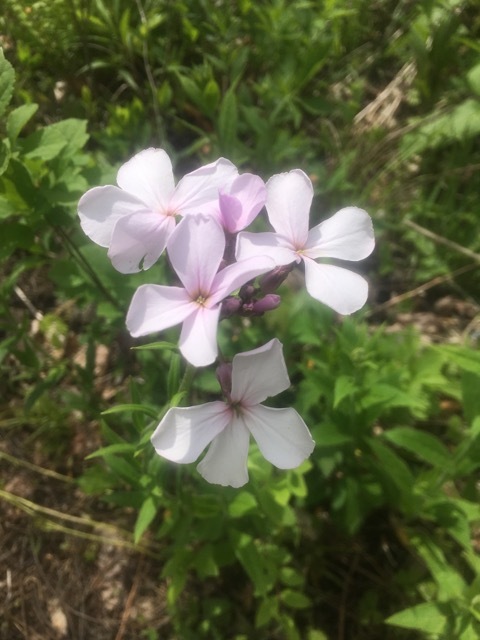 The trail meandered along through a forest with some nice dogwoods and violets in bloom and then reached the foot of the mountains. Ahead of us were too final big climbs. The first was gradual and the area around the trees was starting to really green out. It looked like we were walking through the emerald forest at times. Views east through the trees to the trip’s previous peaks were plentiful. We sang volleys of Billy Joel’s “You May Be Right” to get us through the climb. As the trail leveled out at the height of land we stopped for a few minutes and talked about what we would eat when we got off trail. I was looking for filling and greasy, of course. The trail then descended into another gap, where an old forest road, and part of the R-D trail re-appeared from where it had previously branched off on the last peak a few miles back. I hadn’t recalled the last climb looking as steep on the profile as it ended being, but we were definitely working hard at that point to get up it. It went most of the way up the next summit before it eventually rode around the shoulder and leveled out for the most part. But we were only about 100 feet shy of the summit so they might as well have just taken us all the way up! As we ascended we noticed that the colors of the leaves on the trees painted a very fall-like scene. The trail traveled along this mountain’s shoulder for about 3/4 of a mile through mountain laurel tunnels before reaching the road crossing at Arden Valley road. I believe all of this was part of Fingerboard Mountain. We crossed the road and took the blue trail by the water tower back down to the parking lot at Tiorati Circle. Since we decided not to take any longer breaks or have a hot breakfast we made good time and were back at the car in less than three hours. And though we did start to slow quite a bit at the end from fatigue, we made sure to appreciate the scenery the best we could, including a lovely mountaintop brook and one vista similar to that of Bear Mountain, Connecticut from Lion’s head. We drove the same route home as we took up, opting for the long views up and down the Hudson river, and found a great country diner on the way home called Grandmas. We loaded up on greasy appetizers and sandwiches and I also had a few celebratory beers. We picked out a few of their homemade pies to bring home to the kids. While it was challenging, we had a great time, and look forward to finishing the last two sections in New York later this season. Who knows, maybe we will get there even sooner.